A river is a large natural stream of water that usually flows into a larger body of water. 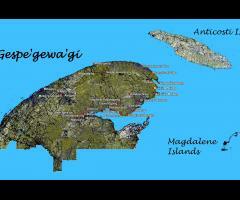 The rivers of Gespe’gewa’gi have been very important to us and our ancestors. In the spring, summer and fall they used canoes that they made from birch bark to travel along the rivers. And in the winter, when the water was frozen they’d use snowshoes and dog sleds to cross.